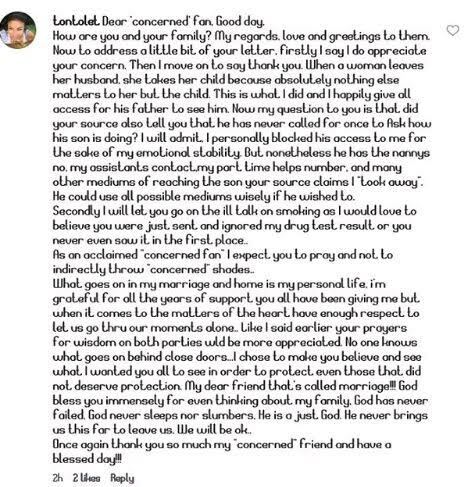 Tonto Dikeh's marriage has been going through rocky waters lately and Fans prayed that the couple would indeed weather the storm and work through their challenges but it seems worse than it looks as the actress revealed in a recent post in response to a fan's open letter..
"Dear ‘concerned’ fan, Good day. Now to address a little bit of your letter, firstly I say I do appreciate your concern. Then I move on to say thank you. When a woman leaves her husband, she takes her child because absolutely nothing else matters to her but the child. This is what I did and I happily give all access for his father to see him. Now my question to you is that did your source also tell you that he has never called for once to ask how his son is doing? I will admit, I personally blocked his access to me for the sake of my emotional stability. But nonetheless he has the nanny’s no, my assistant’s contact,my part time help’s number, and many other mediums of reaching the son your source claims I “took away”. He could use all possible mediums wisely if he wished to. As an acclaimed “concerned fan” I expect you to pray and not to indirectly throw “concerned” shades. What goes on in my marriage and home is my personal life, i’m grateful for all the years of support you all have been giving me but when it comes to the matters of the heart have enough respect to let us go thru our moments alone.. Like I said earlier your prayers for wisdom on both parties would be more appreciated. No one knows what goes on behind close doors…I chose to make you believe and see what I wanted you all to see in order to protect even those that did not deserve protection. My dear friend that’s called marriage!!! God bless you immensely for even thinking about my family, God has never failed, God never sleeps nor slumbers, He is a just God. He never brings us this far to leave us, We will be Ok.. Once again thank you so much my “concerned” friend and have a blessed day!!!" However for Valentines day today,The Actress says..
"Today is valentine,Happy me to you.Make the best of today,Take a lil time to pray for your loved ones as I pray for al mine this very moment..God bless you and HAPPY VALENTINE LOVERS"